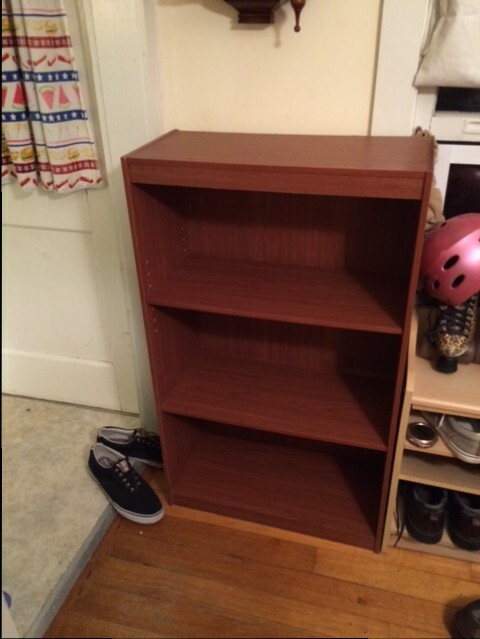 OK, so in my last post, I enthused about how I was going to kickstart my dining room decluttering project by tackling the Small Bookcase. 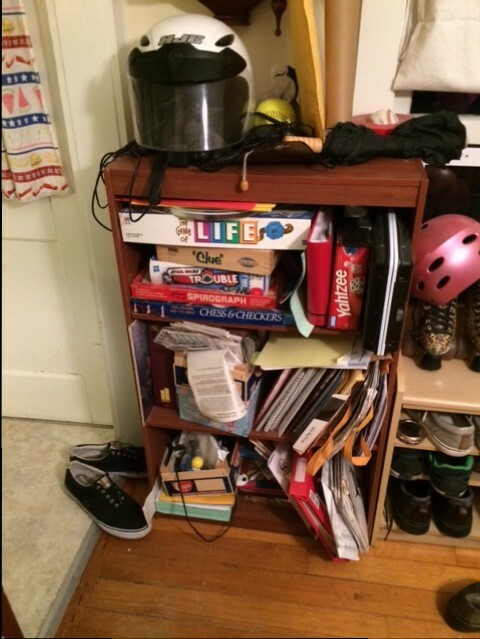 You remember the Small Bookcase? If not, see above. Of course, I procrastinated until it was dark outside, so the pictures are not that great. However, I did finally get up off the couch and dive in (actually I went for a 5-mile run and was pretty beat, hence the late start). The first thing that I did was remove everything from the shelf. This is a very important step! Do not skip this step when decluttering! We are not deciding what to get rid of, we are deciding what we want to keep. It also allows thorough cleaning of the space before returning any items to it. 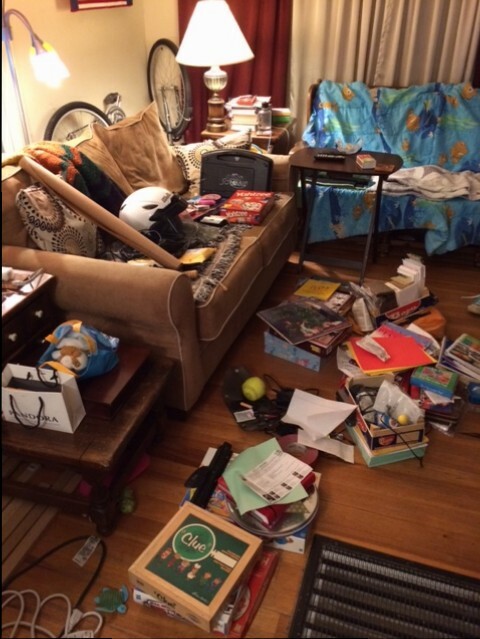 I moved all the items to the sofa and the living room floor. Wow! What a mess! How did all that stuff fit on that little shelf? 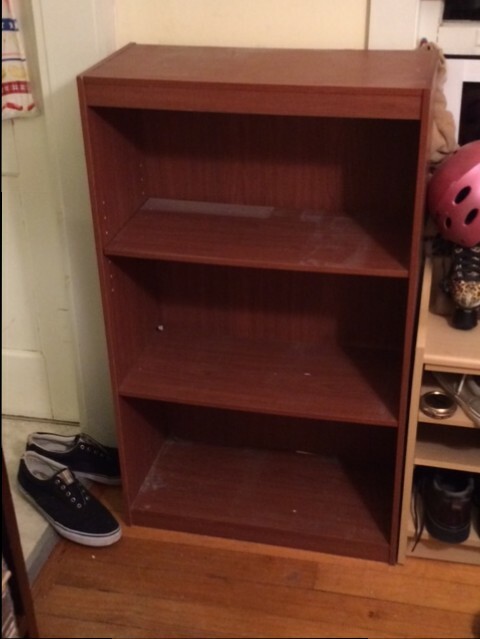 Here is a picture of the empty shelf, so you will know I didn’t cheat and leave a few items on it. Ick! Dusty! Next, I cleaned the shelves. They are not “real” wood, as this shelf came from Target many, many years ago, so I used some diluted Mr. Clean and part of an old t-shirt to clean them. See how much better? 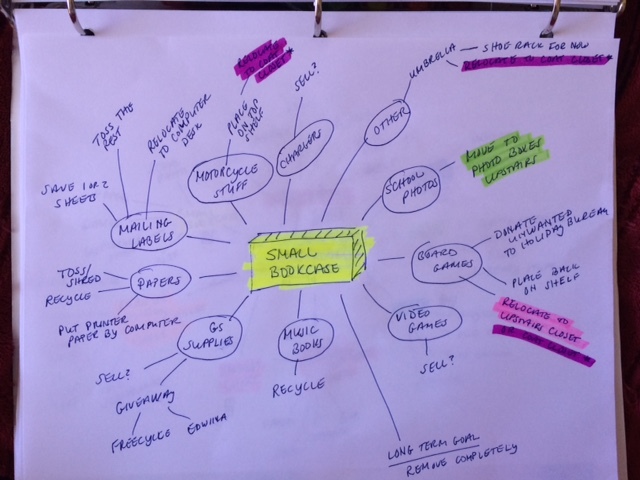 Next, I divided the items from the shelf into the categories that I had defined in my mind-map. Remember my mind-map? 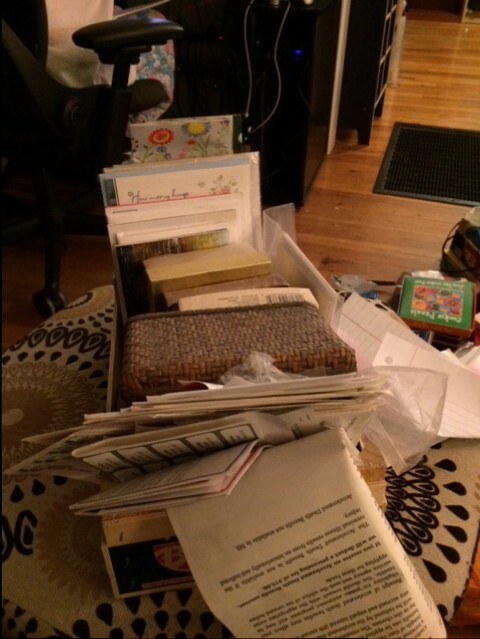 I started with the very dusty wooden bin crammed full of mailing labels. 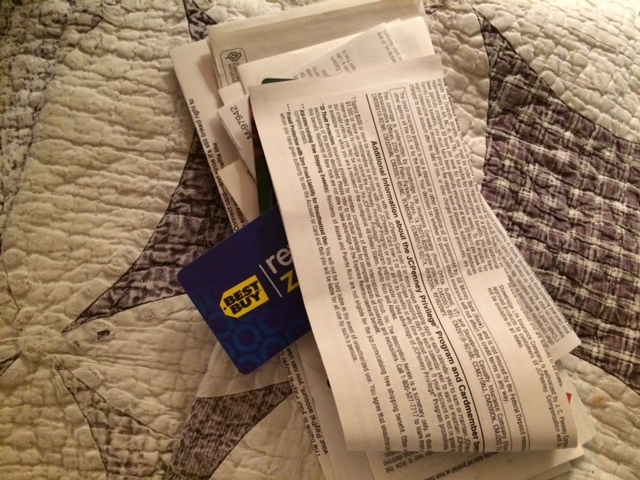 I discovered that it also contained some cards and “thank you” notes, stamps, some credit card agreements from years ago, and actual credit cards that I cancelled years ago. You can see that I chose also to keep the Ident-a-Kid IDs that my daughter had made in elementary school. She was just so darn cute! 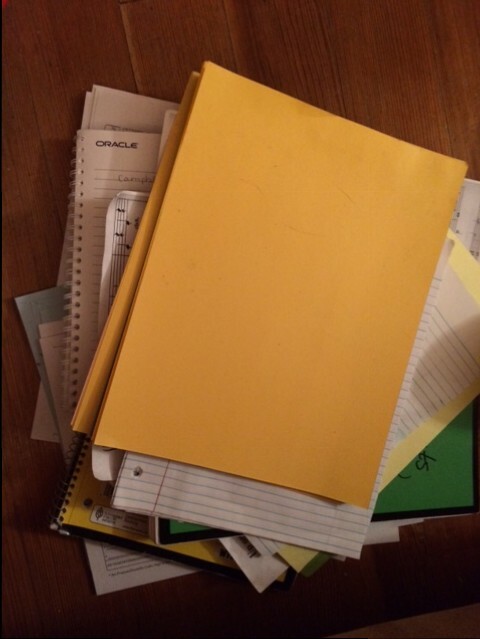 Here is the pile that end up going into the trash. Here is what got recycled. I considered putting the notecards on Freecyle, but they were pretty dusty. Here is what went into the shred box. 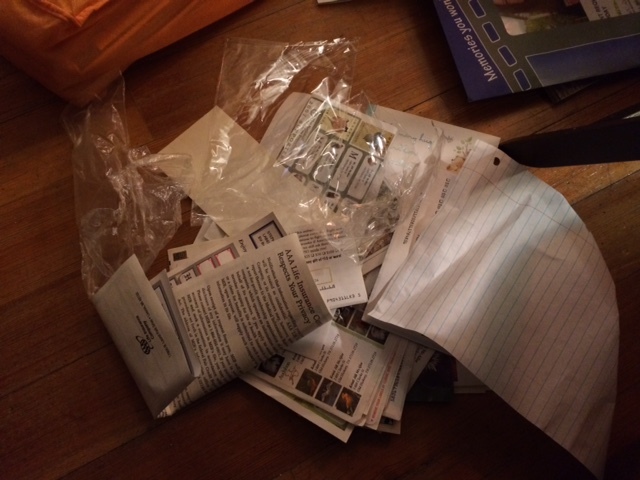 Next, I tackled the pile of random papers and envelopes. A few things were thrown away, but most were recycled. 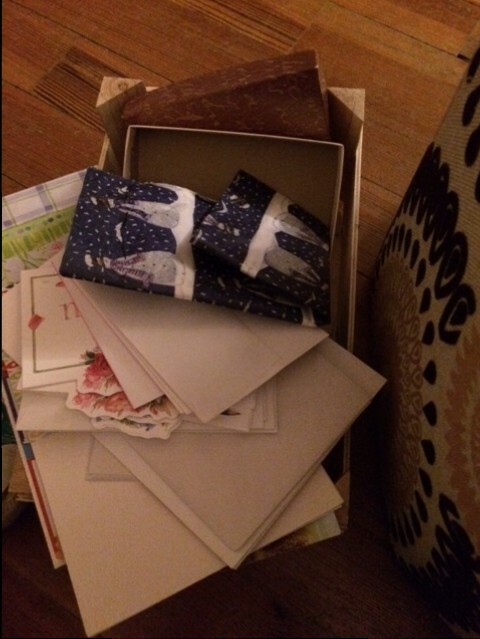 The envelopes that you see in the picture had writing on them so that they could not be reused. 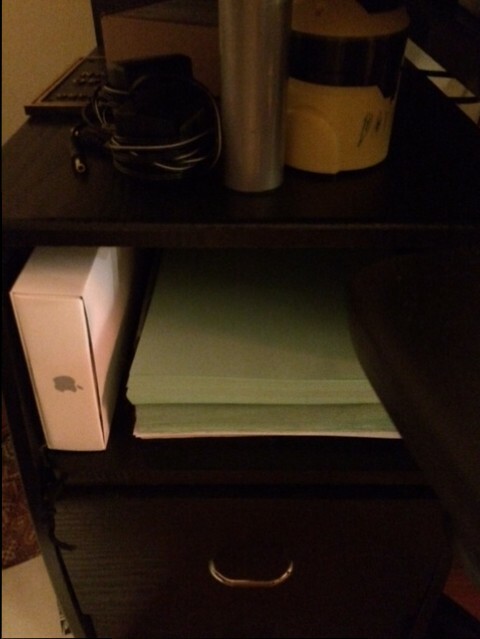 However, a ream of green paper got moved to the computer area, where it can be used to print out drafts of homework, coupons, etc. 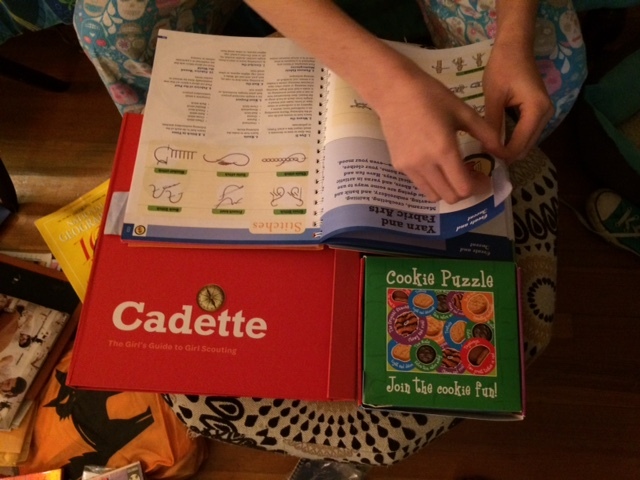 I gave the Girl Scout supplies to my daughter to go through. She is moving up to Senior next year and doesn’t need these badge and program books anymore. 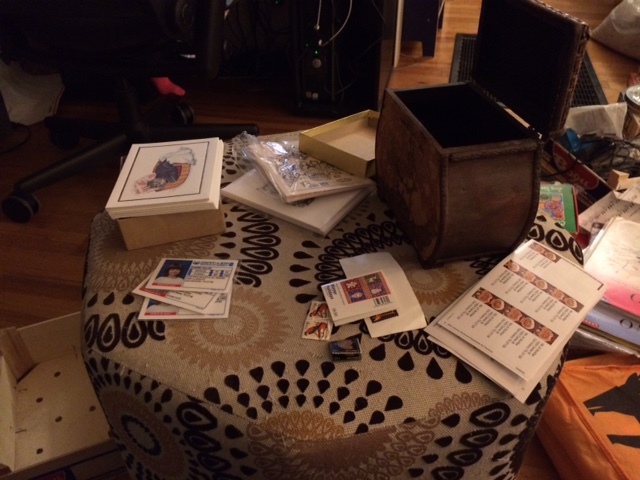 Here she is, going through them and checking for writing, removing sticky tabs, etc. I will try to sell them to McKay’s, but if they don’t want them, I might try eBay or Freecycle. 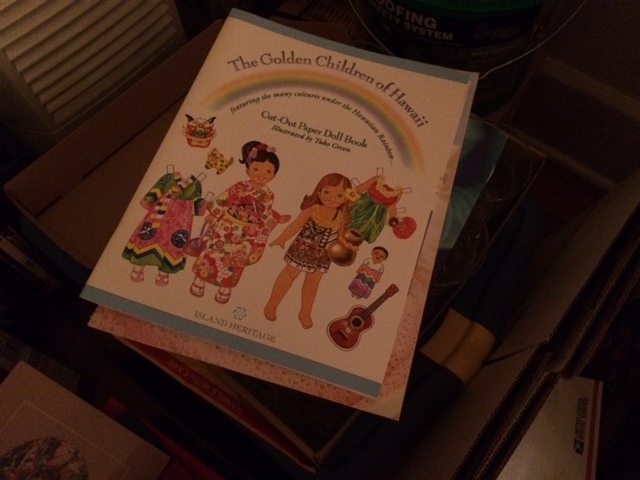 I put them into a pile with these Hawaiian paper dolls and unused coloring books, also to go to McKay’s. I gathered all the photographs together and took them upstairs. We have a least two large bins of photos in the third bedroom, so I put them with those. Now, most of the photos in the house are together in one place, though I suspect there is another box somewhere. 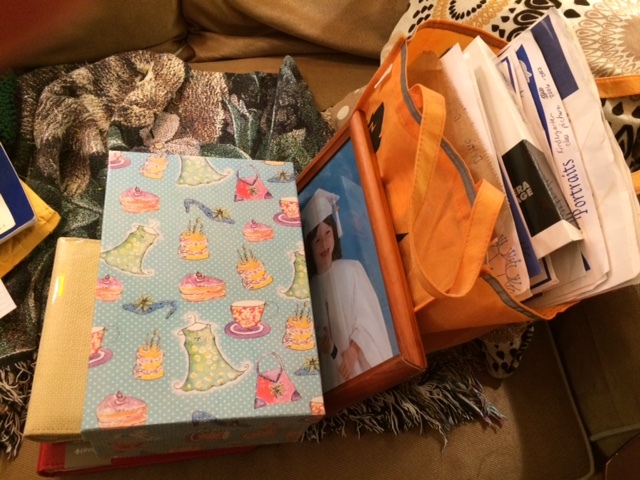 At some point, when I have finished the majority of the decluttering, I will go through the photos. But not now, as I am sure that project will take months by itself! 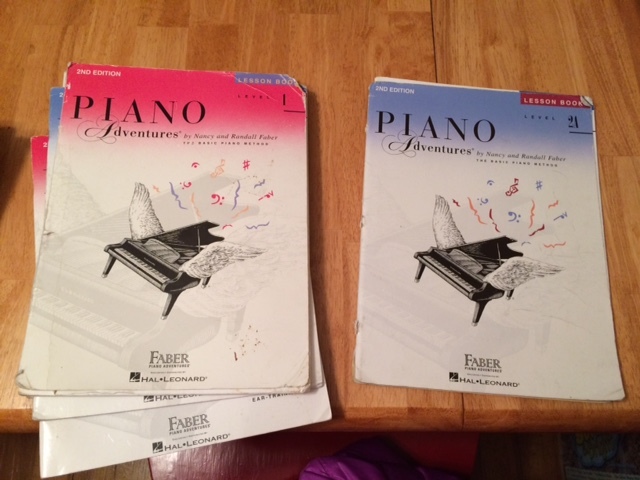 I had my daughter go through her old piano books and select those that she wanted to keep. The others were recycled. They had been extensively written in and were falling apart. 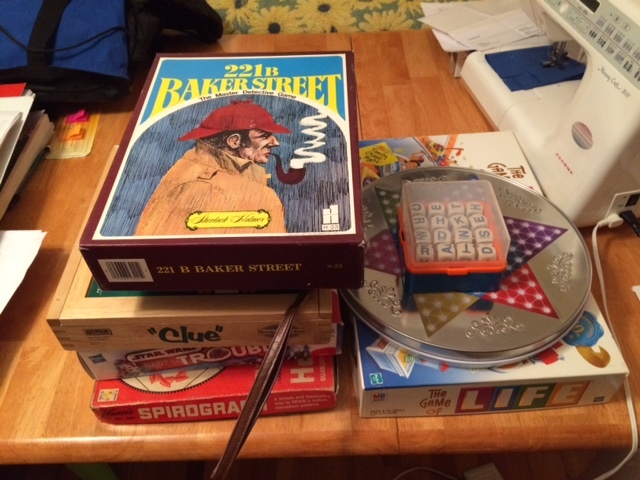 I gathered the boards games and selected the ones that we wanted to keep. The others, we will try to sell at McKay’s, or will give to Holiday Bureau. I dusted the ones that we wanted to keep and placed them back on the shelf. Eventually they will go upstairs, above the linen closet (once it is completed). At this point, my husband came home with pizza! (I had a coupon.) 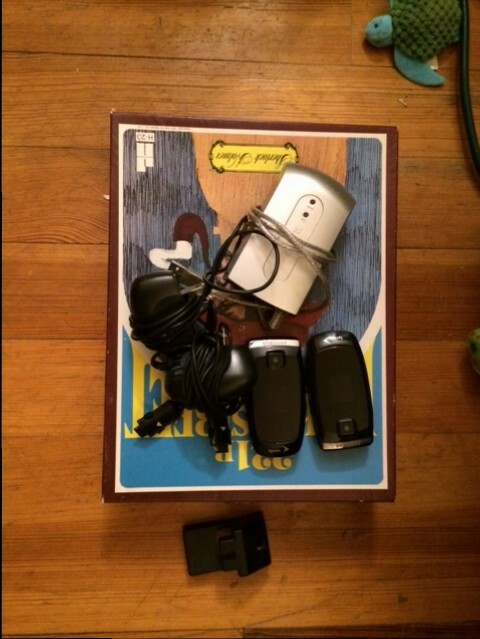 He gathered all the chargers together, figured out what they went to, and bundled them neatly. He says that he thinks that McKay’s will take them. He also cleaned up the plug-into-the-TV video games. There was some discussion of keeping them, but I pointed out that no one had played with them in 5 or 6 years. So they will go to McKay’s, or if they don’t want them, I will try to sell them on eBay. I cleaned up my motorcycle helmet and gloves, tossed a broken face shield, and gathered all the cords for my battery charger. I placed them all back on the shelf, along with an umbrella. These will all eventually go in the coat closet, once it gets remodeled. There were a few other miscellaneous items that will get donated, probably to Holiday Bureau and Southern Thrift. There were also a couple of packets of hardware to our upstairs window, that need to be installed (but I have to paint the window first). These went back on the shelf for the time being, along with a three-hole punch that does not fit in the desk drawer. And here is the final result! Da-da-da-DAH! Motorcycle gear on the first shelf. Piano books, a couple of spiral notebooks, and the mailing labels / stamps / notecards on the second shelf, along with the window hardware and three-hole punch. Board games on the bottom shelf. 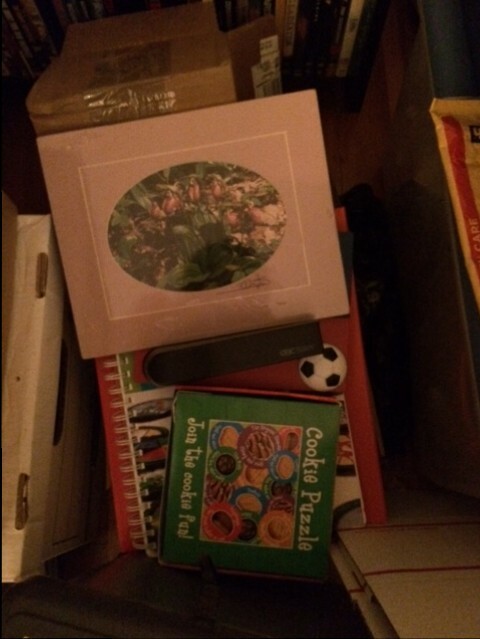 And I put the packing supplies that I use for eBay on top of the bookcase. So much of an improvement! The whole corner feels lighter, and no one is running into things sticking off the shelves as they go in and out of the kitchen. The whole family was involved in the sorting process, so everybody knows what went and what stayed. 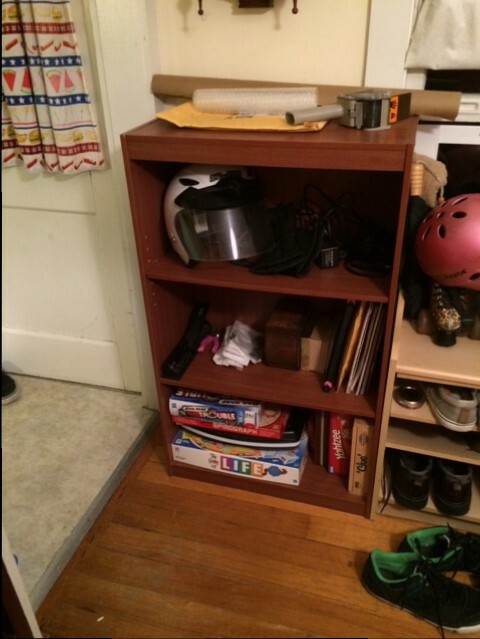 And everyone will benefit from the decluttered Small Bookcase. Here again is the glorious before and after.